Determined to uncover a hidden honey hole, the guys are freestyling on their home turf in Iowa. And to keep himself entertained, prankster Frank has a few practical jokes up his sleeve. 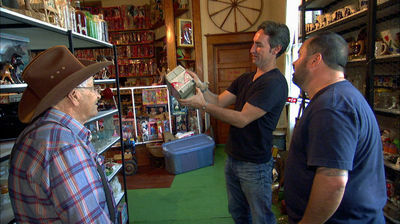 After the boys spot a rusty toy museum sign, lifetime collector George opens the doors to his heavenly collection. A former church turned personal showcase, the shelves are overflowing with vintage toys and George is in the mood to sell. The bearded charmer works his magic and the guys soon find themselves picking with a local history buff. As a fire marshal, John empties abandoned houses before burning them down! He's filled several outbuildings with salvaged treasures. Mike spots an item so unusual he's willing to take a huge gamble. In Des Moines, auction-addict Roger has a 3,000-square-foot mega-pick that's jam-packed with treasure that he's finally willing to sell.